Have the best time in the wild with your best four-legged friend. 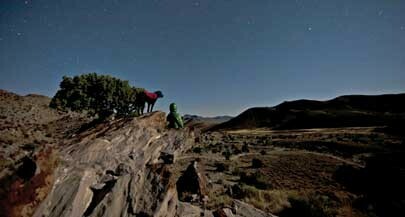 It’s a wonderful image: camping and gamboling in the wild next to your dog—man’s best friend, after all. The reality may not be so ideal. At worst, your mutt takes off, gets lost and ends up as dinner in the wilderness hunger games. Or, in a less-tragic-but-still-not-ideal situation, you and Fido could be camping in a designated watershed or another area where dogs aren’t allowed and be discovered by a forest ranger, who issues you a citation for $125. Meanwhile, don’t roam around the Moab wilderness with your pooch. Dogs are not allowed on the hiking trails in Arches or Canyonlands, and are allowed in just one park in the city—the 1-acre "Bark Park" at 100 South and 300 East. * It’s also hot in Moab in the summertime, so you can’t leave a canine best friend in a vehicle. Relatively cool temperatures of, say, 60 degrees in the sunshine can make a vehicle interior too hot for a dog to survive—even with the windows open a crack. 1. They need more water than humans. Don’t depend on river or lakewater; it may be contaminated by parasites such as Giardia that can make your dog expensively sick for weeks. If you’re not sure of a potable water supply, bring enough for your pooch. 2. If getting to a chosen campsite involves a long hike, make sure your pet’s foot pads are up to it. Veterinarians frequently treat dogs with bleeding paw pads worn down by long hikes. You can buy protective dog shoes in most outdoor shops. 3. Prepare by practicing camping with your dog in the backyard so that using a tent or sleeping bag becomes a familiar routine to you both. 4. Any dog going camping should be microchipped, so that even if the collar tag is lost, the owner can be located. Now for the good news: There are plenty of places where you can camp with your pooch. Dogs are welcome in state parks, but must be leashed at all times. They aren’t allowed on park beaches, such as the areas around Yuba or Bear Lake. Camping resorts such as KOA allow dogs, as does Strawberry Bay Campground, which offers a plethora of trails around the huge reservoir. *Editor's note: This article has been updated with information about the Moab dog park and clarifications of the pet regulations in Canyonlands and Arches.